Do you love fashion and shopping? Today, Novotel Bangkok Ploenchit Sukhumvit would like to introduce you the huge luxurious shopping mall in Bangkok.Central Embassy Bangkok is luxury shopping mall, full of impressive collection of high-end designer stores, artistic-dining restaurants, deluxe cinema screens, and other entertainments. Central Embassy was built on the grounds of the former British Embassy, so it was named by the location of this shopping mall. Central Embassy Bangkok is a modern and stylish shopping venue houses flagship store of brand designers, bridge fashion shops, famous life style units, dining options and world class entertainment facilities. The huge building includes six main shopping floors boast wide open concourses with minimal decoration and gorgeous environment. 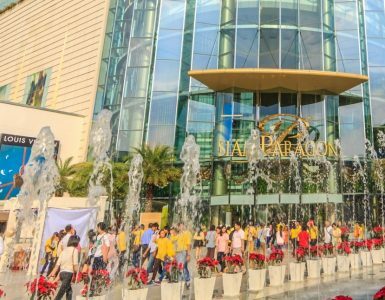 This shopping Centre has several of hi-end brands both from Thai and foreign designers such as Chanel, Christian Louboutin, BOYY, Disaya, Givenchy, Gucci, Miu Miu, Prada, Versace and many more. It also has food area which mixed differences of cuisine for example Thai food, dessert, street food, Chinese food, cafe and other. This is not all, Central Embassy also has jewelry, watches, and accessory zone like Omega, Rolex, Parvay, Chavana and etc. 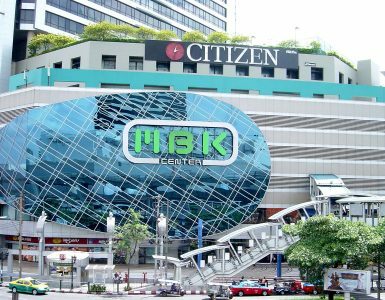 As well as being the most luxurious shopping mall in Bangkok, it may be able to refer as the city’s most convenient one too. Central Embassy located in the heart of Bangkok (Ploenchit area) and can be directly accessed from BTS Skytrain – Ploenchit station exit 5. If you travel from Novotel Bangkok Ploenchit Sukhumvit, you can go to the shopping mall by walk within 5 minutes. In addition, there is a skywalk connects Central Embassy to Central Chidlom which you easily come to Central Embassy. If you are the one who loves luxury brand stores and design, don’t forget to visit Bangkok’s famous luxury shopping mall “Central Embassy” which is perfectly located at Ploenchit Junction – next to Novotel Bangkok Ploenchit Sukhumvit.